I'm a sucker for magical girl books. All I ask for is cute art (check), a sweet main character (check), some kind of overarching quest (check), and silly catchphrases (check!) and I will love it probably way more than it really deserves. The environmental theme (the Mew Mew girls have all been infused with the DNA of endangered animals, and there's a "saving the environment" thread) is... not exactly well-developed. It's just the backdrop for fighting monsters in adorable costumes. I am totally fine with this. I didn't plan on reading Tokyo Mew Mew so soon, but when the opportunity presented itself, it was hard to say no to such a pretty pink package. I actually watched the first part of the English dubbed anime of Tokyo Mew Mew, so coming into this I already have a certain fondness for these characters. However, reading this, I was surprised how hard it was for me to get into the characters. The story is fun, and cute, and a little flirty, but something about the dialogue didn't sit right with me. A lot is going on in these first two volumes as we're introduced to every main character and the role they play in the story. Each girl of this bio-weapon squad has to discover their power and join team Mew Mew, so introductions are fast and boss battles are happening every few pages to get them into the fighting spirit. This I had no problem with, but the dialogue kind of ruined it for me.I don't know whether to blame the translation to English or the original text, but the conversations between characters did not sound natural. It was hard for me to just let loose and enjoy these adorable girls being adorable when I keep having to stop and cringe at lines that are either way too hyperbolic for the situation or just don't sound right in English. I wish I could give you examples of what I mean, but I don't have the book in front of me. It may just have been the style of the manga, I could understand that these girls are like the super-cute x1000 versions of normal people, so some things in the manga are just going to sound ridiculous and purposely so. But then there would be this stretch were I wouldn't notice any problems with their speech and then BAM! awkward sentence.Unfortunately my problems didn't stop there... Masaya. He's apparently this great guy, which came across pretty well in the anime, but here his most stand out moment is when he gives Ichigo her signature cat collar. And what is suppose to be this adorable gesture was not only very possessive, but rather unsettling for me. It's difficult for me to describe exactly what it was about this moment without pointing at the page and going "there, look at that", but keep in mind he's giving her a collar meant for an animal and I'm sorry, but that pushes one of my buttons. His possessiveness in his dialogue coupled with his expressions in the art made me uncomfortable. So here's the equation that inadvertently happened in my mind when I saw this.GIRL: Very sweet, but pretty much does whatever other people want her to do without much objection.GUY: Totally perfect till things don't go exactly how he wants it too, which is when he suddenly does a complete 180 and gets really possessive giving GIRL a collar meant for a pet. Wow, how incredibly romantic. That in no way remind me of any sort of unhealthy relationship dynamic. Nope. None whatsoever.I know I'm probably thinking about this way to hard and being too harsh. I mean, Tokyo Mew Mew is suppose to be this fun manga with an interesting plot about endangered animals, and aliens, and cute girls in equally cute costumes. I need to step back and remember to enjoy those parts. Which I did! The girls were so much fun and I can see how the plot is going to get more and more interesting. ... but I just can't get past that moment. I know that this guy is the romantic lead of the entire story and I am just so uncomfortable with how this blah moment just barged into the middle of my good time. However, I've decided that I will keep reading the series, it deservers an honest shot and who am I to deny it that. I just hope that I don't encounter more of these sort of moments. Talk about a trip down nostalgia lane! The first time I read Tokyo Mew Mew was going into my freshman year of high school, back when it was being published by Tokyopop. I didn't own the series myself but between all the friends who collected it, I was able to read it. 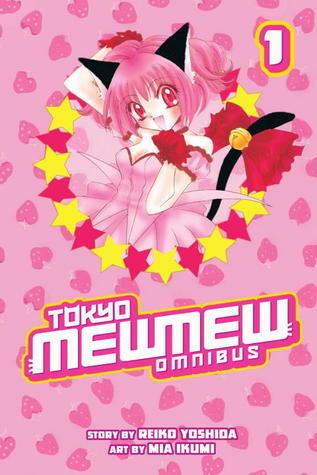 Recently I was hit with the urge to re-read the manga, and thus decided to buy the Kodansha Comics omnibus editions with the updated translations.For those unfamiliar, Tokyo Mew Mew is a magical girl series centered on Ichigo Momomiya and four girls that become her teammates in an on-going battle against a race of aliens who are trying to take over the Earth by infecting animals with alien parasites to use as biological weapons. Ichigo and the girls are all fused with the DNA of various "red data" animals that are near extinction to help them combat the alien threat.Cynics will probably take one look at this series and denounce it as uninteresting due to the heavy number of magical girl tropes, cues borrowed from other magical girls series (especially Sailor Moon,) and the additional slice-of-life aspect that pervades the storyline.Personally, I don't think that anyone should let that prevent them from giving this series a try. It tends to be pretty light-hearted, and for a lot of younger individuals who were still cutting their teeth on anime back in the early 2000s, this was the gateway defining magical girl series for them. It's fun and the characters have a lot of heart, and my opinion of it hasn't diminished since the first time I read them as a young teen. I do recommend reading the omnibus editions by Kodansha Comics if you want to pick it up; Tokyopop doesn't deserve anyone's money, and even if you could find Tokyopop's single volumes of the manga, the translations are lacking compared to the Kodansha editions. (The only issues I really take with Kodansha's English translations are the shortening of Zakuro's name to "Zacro", and translating Pudding's speech tag of "no da!" into the longer "na no da! ", which feels a bit excessive. )I've enjoyed this first volume and can't wait to continue on with the second~. 4.5 starsThis was fantastic! What a lucky break--I didn't even know this existed until I happened upon it at the library. I loved this so much! Tokyo Mew Mew is exciting, funny, adorable, and just overall outstanding! Ichigo is so fun and cute; she is a wonderful main character! The art style is also very pretty and easily readable; I didn't get confused during the actions sequences at all. I can't wait to read the next omnibus volume and see what comes next. Honestly, reading this reminded me of why I love manga so much! It isn't sailor moon, but I liked the idea of magical girls with the dna of endangered animals and of course, my favorite is Lettuce. She's quiet and makes mistakes when sometimes the other characters come of as perfect. So this series does not start off really well. This series is supposed to by kind of corny, which is usually rather ok with me. I'm not sure what it is with this one, but we didn't quite hit it off. Though I do like the rest of the series. I’d say 3.5 stars. It wasn’t the greatest manga (Sailor Moon is better) but it was super nostalgic and I’m a sucker for ships. Overall, it was an enjoyable trip down memory lane. Who da fuq names their kid lettuce tho? I loved this book. I wish I had known about it awhile ago. It is so much like sailor moon because there are five girls who were injected with this serum that turns them into a new species of human/animals. These girls do not know about their animal powers yet, so it is up to a young girl named Ichigo to find the other four girls so they can unite and fight aliens who are trying to destroy earth so they can take it over. The girls do not get along when they meet each other, but they begin to develop a bond with each other overtime. I would have to say I like this manga more than sailor-moon because the girls are not fit into a stereotypical identity, and they are named as food such as lettuce, mint and strawberry (Ichigo). They are not afraid to hide their identities from the public. They were posted in the newspaper for fighting evil, and the sailor scouts were not. I like that these girls get public attention, are not afraid to be themselves and are not fit into stereotypical labels. Junior High student Ichigo Momomiya is nothing more than ordinary, until one day while on a date in the park she becomes infused with the genes of an Iriomote Wildcat and becomes super hero Mew Mew! Now she must find her four fellow comrades and collect precious purifying substances hidden all over the world called Mew Aqua in order to save the world from invading aliens. I've only got one word for this book. Nostalgia!!! Doing a marathon of my magical girl manga and I loved this as much as I did my first read. Goodreads really need a feature that allows me to re read something!